I t may sound trite, but memories really are made here! Year after year families return to Bosebuck to relive past experiences and create new ones with the newest addition to the family. No commute, no schedule, no TV to get in the way of your quality time with loved ones. Spend the day on the lake, the front porch, around the campfire or wandering throughout the beautiful landscape that surrounds camp. In addition to fishing and boating, kids also enjoy such simple pleasures as hiking, nature walks, picking berries, and learning to build a fire in the woodstove. And of course they’ll love canoeing, kayaking, and searching for Indian arrowheads. Bosebuck Mountain Camps has always been a special place for kids to have great times with their parents and /or grandparents. Stress is not just a man’s disease and at Bosebuck Mountain Camps, more and more women are finding natural, healthful ways to tame their tensions. Many are discovering (or re-discovering) their fondness for nature and out-door activities. If you’ve lost touch with that “child-within”, this is a great place to reconnect. Canoeing, kayaking and hiking are the most fun and relaxing ways of getting exercise you can imagine. We can pack you a field lunch if you want to stay out all day. If you’re nervous about getting in a boat or kayak on your own, we can help. 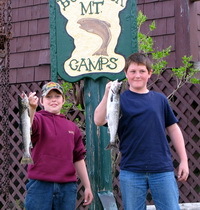 Guides are available for fly fishing (novices and experienced) as well as guided hikes and canoe/kayak trips. Bosebuck is a great place for the quiet pleasures also: Reading, writing, painting, photography and meditation are all enhanced by the peaceful, pristine mountains and waters. Bask in the quiet serenity of our wilderness. In recent years, various women’s groups have found Bosebuck to be the perfect place for their specialized retreats. We’ve hosted a group of women artists several times and another group comes annually for spiritual and emotional self-healing and renewal. Women seem to have a special capacity for feeling and connecting with the ancient spirits of this remarkable place.